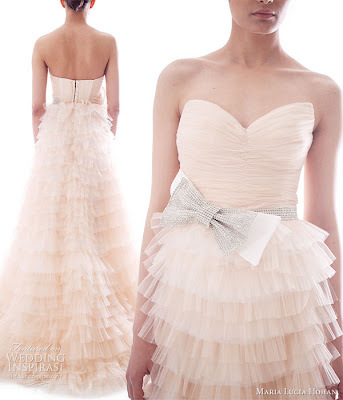 Pleats, bows and mousseline...oh my! When I stumbled across some wedding dresses by Romanian designer Maria Lucia Hohan it was love at first sight. 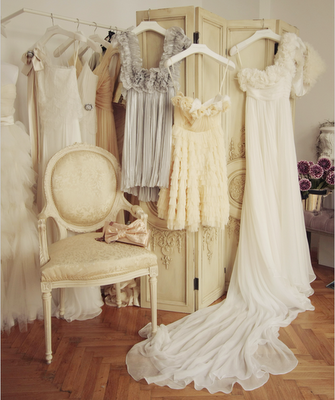 The vintage touches, the ethereal romance, the ultra feminine details...the whole collection just captured me. Surprisingly, they are very reasonably priced - most bridal gowns under 700 euros. And what about the maids? MLH has some beautiful gowns that are great alternatives to what you typically find offered for bridesmaids in the stores. Some of these shorter, flirty dresses would also be perfect for an engagement party, rehearsal dinner or night out on the honeymoon.